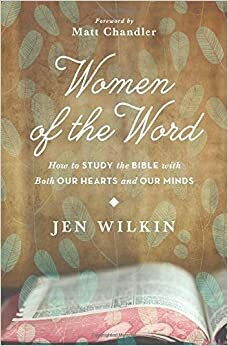 My wife Carly was kind enough to read and review a recent release from Crossway by Jen Wilkin, a Bible teacher and author from Dallas. Here are her brief thoughts on the book (and I can speak for her: she gives it five stars!). J en Wilkin. Women of the Word: How to Study the Bible with Both Our Hearts and Our Minds. Wheaton, IL: Crossway, 2014. $9.94 (Amazon). Jen Wilkin is an author and Bible teacher who attends the Dallas mega-church The Village. In this new book intended to help women in their study of Scripture, Jen reveals her own struggle with being raised in church yet being biblically ignorant. This gives the book such a real and personable feel. No one wants to learn from someone who claims they have it all together! Her personal stories are easy to relate to and help the reader understand the information in the book. The chapters are quick and easy to read, but contain vital content for becoming more biblically literate. In the opening pages, Jen talks about the mountain of Biblical illiteracy many Christians face (chs. 1-2). And she says that this mountain must be moved one spoonful at a time. Yes! But just by the end of the introduction, I was ready to put on my work boots and start digging! The highlight of the book comes in chapter 6 where Jen talks about the process of study. Her very practical process does seem a bit daunting and time consuming (especially to this stay at home mom of two toddlers!) but our generation is biblically illiterate and starving for a reason. We assume we don’t have time to study the Bible in depth so we give ourselves 5 minutes a day to “read the Bible” which really just means reading the verse of the day that we have texted to us while we’re brushing our teeth. The biggest take-away for me–the one line that stood out–was when she wrote, “The heart cannot love what the mind does not know.” I think I shouted “Amen!” out loud at that point. If we want to know and love God deeply, we must know and love his Word. You must spend time studying God’s word if you want to know and love him! If you gain nothing else from this book (believe me, though, you will gain more than this), you will gain a hunger to know God’s word deeply, and be mastered and changed by it. So, I highly recommend this book to new and mature believers alike. I would love to see women’s ministries in churches read this book before launching into Bible and book studies which are helpful, but may not teach women to study the Bible for themselves. It’s easy to read and engaging even for people who don’t usually read non-fiction. After reading only a few chapters (and hi-lighting every other line), I arranged for a friend to read it with me and we meet and talk about it weekly. It’s been helpful for us to digest together and keep each other accountable in our study of Scripture. Thank you, Jen, for writing this very practical and helpful tool that I hope and pray will be used to bring about spiritual renewal and Biblical literacy among Christians today!